Approximately 80% of the medical devices used in Australia are imported and the domestic manufacturing industry is controlled by subsidiaries of large, global corporations. The Australia medical device market is mature, with a well-formed regulatory system and is one of the slowest-growing markets in the South Pacific region in coming years as market recovery will be slow through 2019 due to Australia's depreciating currency. The market was valued at USD 4 billion in 2016, down from USD 5 billion in 2014. However, Australia's aging population, Federal Budget initiatives, and willingness to adopt new technologies should stabilize the market despite its modest growth. Goldstein Research analyst forecast the Australia medical device market size is set to reach USD 4.56 billion by 2025, at a CAGR of 10% over the forecast years. Intelligent medical equipments are officially endorsed by many hospitals and medical institutions, as well as by consumers themselves, are adding confidence to the Australia medical device market. The report covers the present ground scenario and the future growth prospects of the Australia medical device market for 2017-2025 along with the data of shipments of medical devices and number of labs and hospitals in Australia. We calculated the market size and revenue share on the basis of revenue generated from major players across the country. The medical device market is forecasted on the basis of revenue analysis, product benchmarking and strategic developments of key market players. The report also includes micro and macro factors essential for the existing market players and new entrants along with detailed value chain analysis. Based on product type, in-vitro diagnostics (IVD) equipment dominated the Australian medical device market and accounted for the market share of 35% in 2017 owing to large number of ageing residents with multiple chronic health issues. Surgical and medical instrument is the fastest growing segment with a growing CAGR of 10.23% over the forecast period due to growing demand for devices that manage disability and chronic pain and improve recovery times. Australia Medical Device Market Outlook 2017-2025, has been prepared based on an in-depth market analysis from industry experts. 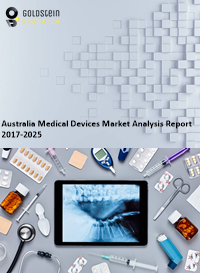 The report covers the competitive landscape and current position of major players in the Australia Medical device market. The report also includes porter’s five force model, SWOT analysis, company profiling, business strategies of market players and their business models. Australia Medical device market report also recognizes value chain analysis to understand the cost differentiation to provide competitive advantage to the existing and new entry players. Our Australia Medical device market report comprises of the following companies as the key players: Johnson & Johnson, Philips HealthCare, Medtronic Inc., GE HealthCare, Siemens AG, Novartis AG, Stryker Corp., 3M Company, Abbott Laboratories, Toshiba Corp., Becton, Dickinson and Co., Baxter International Inc., Cardinal Health Inc., Boston Scientific Corp., Allergan Inc., Zimmer Biomet, Danaher Corp., Dentsply Sirona, Essilor International S.A. and Covidien plc. According to the report, major driving factor is the portability of the devices coupled with the technology as the smaller size of the advanced medical devices also brings down costs by eliminating concerns with storage, portability, and weight, for instance, Neofect’s flagship product is the Rapael Smart Glove, a flexible robotic glove fitted with sensors to capture the patient’s motion and measure the degree of finger and wrist movement. From a regulatory standpoint, the Australian market is very accessible for devices that already carry CE Marking. Further, the report states the biggest challenge is that despite Australia's sophisticated healthcare infrastructure, the medical device market is experiencing slow growth because medical device companies exporting to Australia tends to face fierce competition from manufacturers from the US, the UK, and Japan that already have a strong hold on the market coupled with the relatively weak Australian dollar that will make it difficult for some companies to remain profitable while meeting the price expectations of Australian buyers. Australian total healthcare spending in 2016 was over USD 137 billion and healthcare expenditures was 9.4% of total GDP which is distributed among government sector (67%) and private sector (33%). Australia's healthcare industry is sophisticated and receptive to new product. There is consistent demand for a full range of medical devices, particularly those intended to treat and manage age-related diseases. Imported devices are usually innovative and cost-effective, as the Australian market is motivated to control costs.